Nashville Fashion Week 2016 was a huge success. I am so proud of my city and the NFW team for pulling off an epic week of runway shows and events. Look for my post and Pinterest Best of Nashville Fashion Week 2016 next week. This is my third time around at NFW, and my fourth year blogging about fashion. During that time I've have befriended so many of Nashville's talented fashion designers, boutique owners, artisans and creatives that fully support the idea of inclusion and body positivity. When I wear their clothing and accessories I am raising awareness that fashion isn't just for young, able-bodied supermodels. It's for all of us. To that end, I've partnered with my bff Krystle Ramos, of Pura Vida Vintage, to co-produce Music City's very first evening of inclusive runway segments featuring male and female models of all ages, races, sizes and abilities. And I need your help to make it happen. Fashion is for Every Body will take place on Saturday, September 10th at 6pm at abrasiveMedia in Nashville. Local designers Catland Forever Couture, Amanda Valentine, Nashville Fashion Forward Fund Recipient Eric Adler, and more will show some of their iconic Nashville clothing. Clothing from Pura Vida Vintage and Opium Vintage will also be featured, and John Thielman and Andrés Bustamante are presenting their debut collections. Likewise, we have over a dozen models from age 18 to 50+, tiny to voluptuous, and about half use mobility aids. They are excited to be a part of this project, as are the designers - some of them having shown just last week at NFW2016. We are also putting together a documentary which will play during changing breaks about how the show's participants view their contribution to fashion and inclusion in today's Nashville. The evening will conclude with a pop-up shopping event featuring clothing by the show's designers and boutiques and any artwork displayed on the walls of abrasiveMedia. The inaugural Fashion is for Every Body will pay tribute to David Bowie's iconic influence on fashion, style, and self-acceptance; because #BowieForever. Please help us to show the world that, when it comes to fashion and style, we all matter and join us as we walk or roll down the runway! Fashion shows are usually involved and expensive productions, and our total cost of $4,000 to stage this event is nothing compared to the overhead NFW has. It's still more money than we can come up with without your help, so we've set up an Indiegogo campaign page to raise the funds we need to make this a dream come true for so many people and a positive beacon for the fashion industry for years to come. Everyone involved in the show is volunteering their time without payment. But we still have to pay for the venue, the food and drink, photo and video screens, chair rentals, programs, merchandise and, most importantly, lighting the runway. 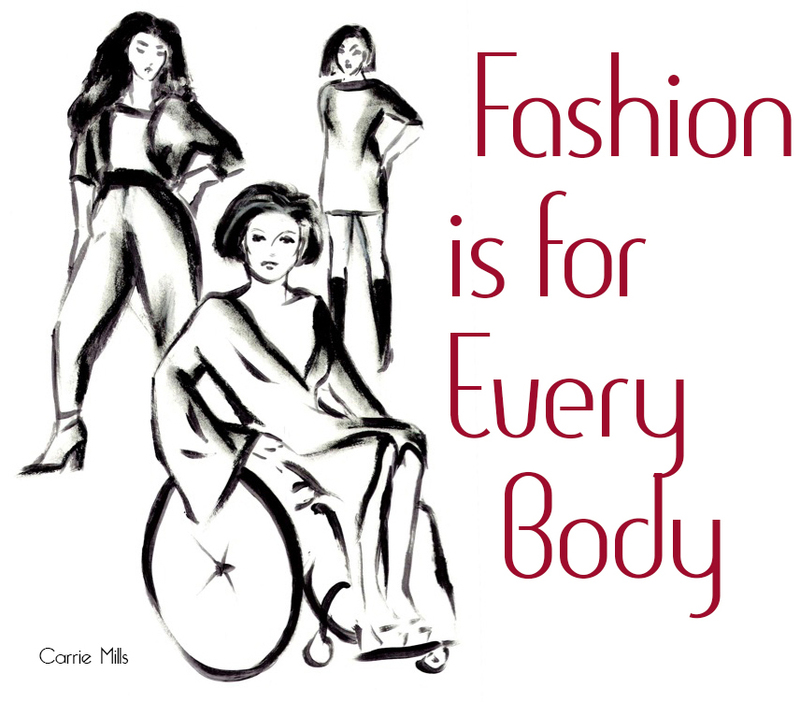 Every penny we collect beyond Indiegogo's fee will go towards funding Fashion is for Every Body. Any money we receive in excess of our needs will go towards next year's show. This is a not-for-profit venture. In return for your donation We have some great, affordable perks. Donors can choose from a T-Shirt, Poster, Bracelet, Advanced Ticket, Program Sponsorship or Step-and-Repeat Sponsorship. Numerous Program Ad Packages are also available. We are fortunate to have Empower Tn - an organization dedicated to cultivating a barrier-free community where people with disabilities are valued equally and participate fully - assisting us in promoting the event. But we desperately need your help, too! Please donate if you possibly can, and join us for the show and/or share our story using Indiegogo's share tools. Follow Fashion is for Every Body on our Facebook, Twitter, and Instagram pages. Strike your best pose and share your photos and thoughts about fashion and style using the hashtag: #fashionisforeverybody.